Dubai is the perfect combination of the old and the new. Its modernity, steeped in a cultural ethos, draws tourists from across the world to enjoy its many charms. Dubai is also about being the ultimate destination; there is something for everyone there and in all seasons. You can enjoy skiing in the summer, shop till you drop, eat the best meals of your life, and experience extravagance like nowhere else in the world. There is, however, a different side to Dubai that is often missed out by first-time visitors. While there are activities in the central city, a short drive leads to some fantastic traditional experiences that showcase the UAE in a different light altogether. Ideal for a day trip, or as the Millennials call it, daycation, these locations allow tourists to indulge in adventure, historical findings, and of course, the untamed glory of the surrounding desert. From admiring contemporary art at the Sharjah Art Museum to understanding the history of Islam at the Museum of Islamic Civilization, Sharjah is a cultural hotspot located a short half an hour drive from Dubai. There are close to 20 museums there. Along with the famous Sharjah Cricket Stadium, the city makes for a beautiful trip for exploring the ancient past of the region by appreciating the many artifacts displayed in the museums. If you enjoy driving and a bit of thrilling action, then a drive to Jebel Jais is the perfect escape for you. UAE’s tallest peak, the winding journey to the top is stunning, especially around sunrise and sundown. For a bit more fun, head on out to the Jebel Jais Flight, which is the world’s longest zip lining experience at 2.83 kilometers. The mountain range is about two hours from Dubai, and while going up its wide roads, there are stops along the way to take in the scenery and appreciate the rugged beauty, which is quite simply out of this world. This might be the most obvious day-trip from Dubai, but it is also the most essential. A chance to be in the desert and enjoy sandboarding, camel rides, and the exhilarating dune bashing, is pure unavoidable fun. To make it all more special, you can opt for dinner along with cultural performances in the night. 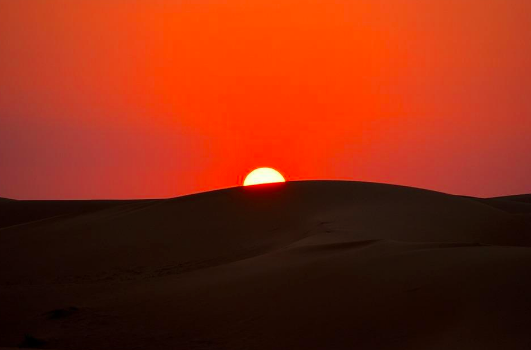 Although the experience is thrilling no matter the time of the day, watching the sun drop behind the dunes in the evening adds a sense of romance and mysticism to the whole experience. Whether you are a speed junkie or someone wanting to indulge in Islamic architecture, a trip to Abu Dhabi comes highly recommended. Ferrari World is definitive when it comes to theme parks with many rides for all ages. It’s all covered making it perfect for any weather. As the capital of UAE, Abu Dhabi has many famous landmarks such as the Sheikh Zayed Mosque, a Heritage Village that celebrates Bedouin culture, the Emirates Palace, and markets that are an excellent place to interact with locals and pick up some local specialties.